Seven-time Formula 1 world champion Michael Schumacher is "still fighting", almost two years after suffering severe head injuries in a skiing accident, says FIA president Jean Todt. Schumacher spent six months in an induced coma after the December 2013 accident and is continuing his rehabilitation at home. Todt was team boss at Ferrari, where Schumacher won five successive titles between 2000 and 2004. "Michael's a close friend," said Todt. "His family is very close to me. We must keep him fighting with the family," he added. Schumacher won his first championship in 1994 with Benetton before retaining his title the following year. 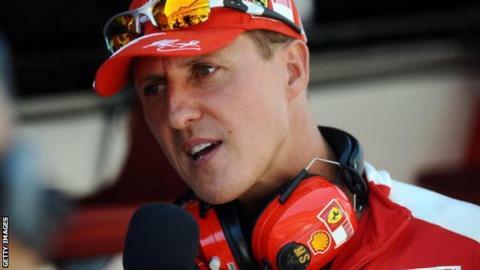 The German then moved to Ferrari where he went on to dominate the sport before calling time on his career in 2006. He returned to the grid with Mercedes in 2010 but endured a largely disappointing three-season spell with a best finish of third at the 2012 European Grand Prix in Valencia. Todt said Lewis Hamilton's third world title reminded him of Schumacher's record-breaking achievements. "It was interesting last week after Lewis was world champion for the third time, you saw the figures," he added. "I was very proud of what Michael did and sometimes you tend to forget what he did. "I see Michael very often and Michael is still fighting."